Two people were injured in a boat crash in Tampa on Sunday, according to authorities. The crash happened in the area of Channel Drive and Cayuga Avenue, near Davis Islands. Tampa Fire Rescue believe a boat hit a pole and crashed. Both people on the boat were injured. They were transported to a hospital unknown conditions. Florida is a beautiful state that is abundant in rivers, lakes, and waterways. Many residents and visitors alike take advantage of the state’s beauty and enjoy various boating activities like fishing, skiing, tubing, and relaxing on the water. Sadly, accidents can occur while on the water. Personal injuries resulting from a boating accident are handled in a similar fashion to a car accident. A man is dead after a boat capsized Saturday afternoon in Tampa, according to the Florida Fish and Wildlife Conservation Commission. The incident happened shortly before 2 p.m. in Hillsborough Bay just south of Davis Islands. Emergency responders arrived at the scene after receiving 911 calls about six people clinging to a buoy. The Hillsborough County Sheriff’s Office used boats to pull some five people out of the water. One of the people recovered from the water, a 57-year-old man, died from his injuries. One person was able to swim to Beer Can Island and was rescued by MacDill Air Force Base Marine Patrol. One person was transported to a hospital for treatment. FWC is conducting an investigation of the boating incident. The boat, which sunk, will be retrieved once the weather improves. Just like anyone driving a vehicle on the road, boat operators have a responsibility to control their vehicles safely on the water. Operators must understand how to navigate the vessel properly, travel at appropriate speeds, comply with all laws, and never operate the watercraft while under the influence of drugs or alcohol. Not all boating accidents can be attributed to operator negligence or inexperience, though. Boating and watercraft accidents can also result from poor maintenance or defective boating design. Issues that arise in boating accidents, such as proving negligence and responsibility, are similar to car accident and truck accident cases. However, when water is involved, there are additional factors that require the expertise and knowledge of a Tampa Bay Boating Accident Attorney at Whittel & Melton. A man was killed and a woman hospitalized after a Sunday afternoon incident at the Courtney Campbell Causeway boat ramp. According to Tampa Fire Rescue, two people were in a boat that hit something in the water. Even if you are operating your boat safely and carefully, it is sometimes impossible to avoid an accident. Our Tampa Bay Boating Accident Lawyers at Whittel & Melton have guided many Tampa Bay area residents through boating accident cases. The injuries sustained during a boating accident can be severe, which can create a stressful scenario for you and your family. We want to help you through this difficult time. Four men were rescued on Friday after their boat capsized near the Sunshine Skyway Bridge. A water rescue call came in around 12:52 p.m. for a small boat that had capsized at the bridge, according to St. Petersburg Fire & Rescue. Officials were able to find all of the men – one was clinging to the capsized boat, and three others were found less than a mile off shore floating west of the bridge. All four men that were on the boat had their life vests on. None of the boaters were harmed. Inexperienced Operation: Many people operating a watercraft on Florida’s waterways lack the proper training or adequate experience to operate their vessels safely. Operator Inattention: A day out on the water is a fun way to relax and relieve stress, however, countless distractions mean some vehicle operators may not be paying attention to various safety concerns, including other vehicles and channel markers. Boating while Intoxicated: Drugs, alcohol and other substances can impair operator’s judgement and reaction times, leading to dangerous scenarios where accidents are likely to occur. The Tampa Bay Injury Lawyers at Whittel & Melton would like to wish everyone throughout Tampa and the state of Florida a very happy Fourth of July! During this summer holiday period, many of us celebrate the time with friends and family. As with many other holidays, risks of accidents and injuries can increase during the Fourth of July weekend. Drunk driving accidents, injuries and deaths always peak during Fourth of July weekend. If you plan on celebrating Independence Day with a few drinks, make sure to drink responsibly and plan for a ride. Make arrangements with friends or family, or call a cab or transportation service like Uber or Lyft. Remember, law enforcement officers will be out in full force this weekend looking to catch intoxicated motorists. Always follow instructions and supervise children. Never provide fireworks to small children. 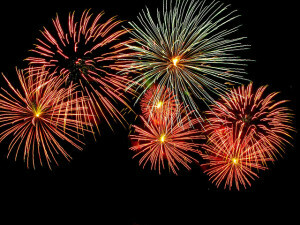 Use fireworks in a safe area where they cannot harm others or damage property. This may be a given, but never throw or point fireworks toward people, vehicles, structures, or flammable materials. Do not light multiple fireworks at once and never attempt to relight a “dud” firework that failed to go off the first time. Many Tampa Bay residents celebrate the Fourth at the beach, lake or by enjoying the water at backyard pool parties. When having fun near the water, make sure that safety is a top priority. Supervise children, use safety vests when on the water, drink responsibly and have a safety procedure set in place in the event of an emergency. Use caution when barbecuing! Many people suffer injuries when cooking on charcoal and gas grills. Never grill indoors, supervise the grill when it is on, follow all instructions and never add lighter fluid when charcoal has already been ignited. Spring break is officially here, which means there are going to be lots of kids, teens, families and college students taking cruises to exotic places. While some will be cruising with their parents, others will be venturing off into the seas with friends. 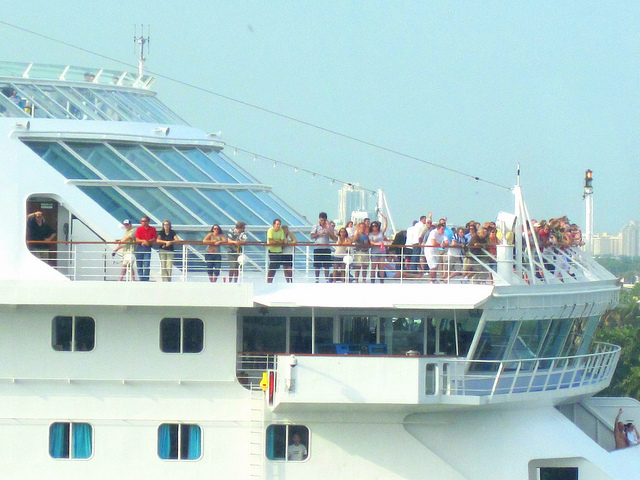 Due to the fact that there will be a higher number of young passengers on board cruise liners, our Tampa Bay Injury Lawyers at Whittel & Melton would like to point out some tips to keep yourself and those you are travelling with free from danger. Travel with a Group. It is much easier to become the victim of an assault or other type of crime when you are travelling solo. Always make sure you have a buddy with you, even though larger groups are preferable. Avoid exploring the ship by yourself at all times. Be Aware of your Surroundings. You should feel free to socialize with other passengers, but keep all interactions well within the public eye. In the event that there is any trouble, as long as you are with others, you will not be alone or isolated. Keep your communications in common areas and in sections of the ship where there is a lot of traffic, like the Lido deck or dining room. Do not allow yourself to be alone with a stranger in their stateroom or in yours. You never want to be in a secluded area that is away from cameras, passengers or other crew members who can assist in the event of an emergency. Keep a Close Watch on Your Beverages. 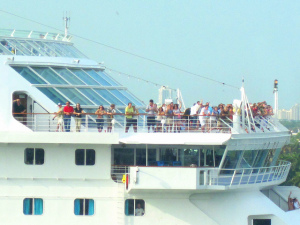 Many cruise ship passengers become distracted when socializing and drinking, making it very easy to slip something in a potential victim’s drink, regardless of whether the drink is alcoholic or not. Since a drink can be drugged in just seconds, it is very important to always keep a close eye on your beverage. Should you walk away from your drink, always ask for a new refreshment when you return. This Saturday, Tampa Bay-area residents and visitors join in an unusual celebration called Gasparilla, one that marks the beginning of a new year and serves as a reminder of ancient times. 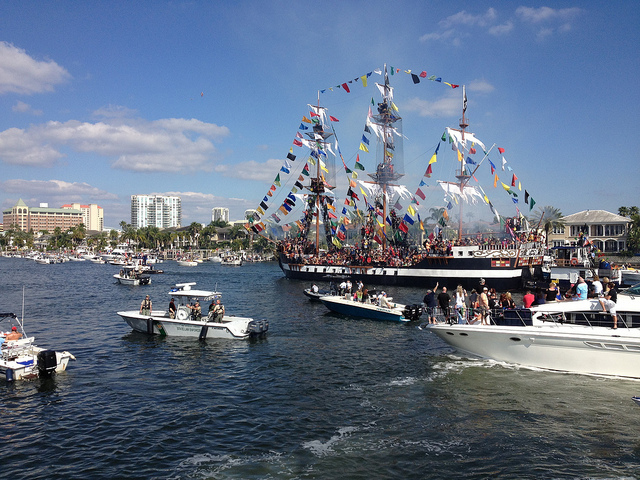 The Gasparilla Pirate Festival was named in honor of the pirate Jose “Gasparilla” Gaspar, who is famed for terrorizing Florida’s west coast during the late 18th century and early 19th century. 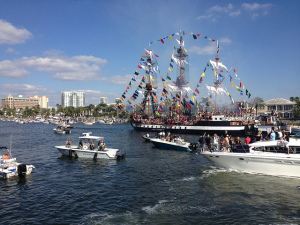 On Saturday, the city of Tampa will be “invaded” by Gasparilla and his men when their 165-foot pirate ship arrives in downtown Tampa, known as the Jose Gasparilla. The mayor of Tampa gives the key to the city to the pirate captain and a victory parade begins throughout the city’s streets. Make sure that you have a designated driver. In the state of Florida, it is illegal to operate any vessel on Florida waters while under the influence of drugs, alcohol or any mixture of intoxicating substances. Keep a close watch out for other boaters and watch your speed! It is important to make sure that you have enough personal flotation devices for everyone on board before you head out on the water. Make sure you have all necessary safety equipment on board and in working order. 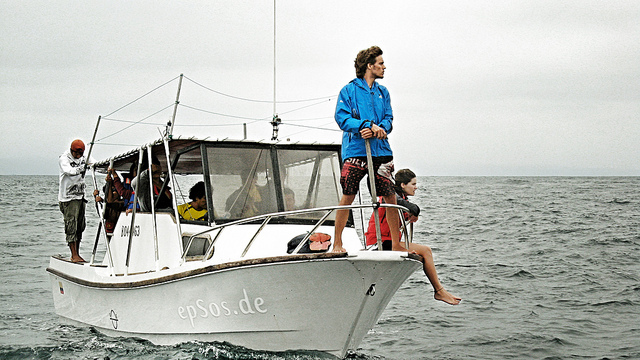 Create a float plan with friends or family and have a working VHF radio on board. Talk with all of your passengers before you head out about what to do in case of an emergency. That way you all have a game plan should your adventure go awry. This weekend you will see many law enforcement vessels on the waterways, including boats from the Coast Guard, Tampa Police Department, Florida Fish and Wildlife Conservation Commission and the Hillsborough County and Pinellas County sheriff’s offices.